What does a community of individualists look like? It seems to me like the modern world is based on individualism and separation and things are getting ever more separate… Single drivers in cars stuck in rush hour traffic, going back to studio apartments and reheating leftovers and single-serving microwavable meals. It takes a lot to cook a meal for just one person! I found this out when living alone. I see people in public spaces staring at their private digital realities instead of talking to each other and laughing together, singing songs and playing guitar. One of the reasons I choose to live in community and specifically at Damanhur is that, even though we are a ‘community of individualists’ with our own quirky personalities and different passions, nationalities (or regions of Italy), ways of cleaning a kitchen and taste in music. Even though sometimes we think, “it would be so much easier to live in my own place, alone.” We are committed to being together and staying together as a community, sharing resources, chores, dreams, games, stories, spiritual inspiration, and we value this deep connection that lasts well beyond the ups and downs and irritations of everyday life. We have a sense of unity and are experimenting with really living this way, acknowledging our connection as individually diverse and specialized cells of a single SuperIndividual body. A Popolo Spirituale, a living community. You don’t have to move to the mountains and build a 12 bedroom house to live in community. You can experiment with it everyday. Helping someone cross the street or carry their groceries. Buying a cappuccino for the stranger behind you in line at the coffee shop. Having a dinner or gathering at your home. Attending a cultural or activist event in your town. 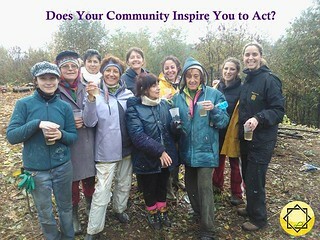 Experiment with a new way of living community this week… let us know how it goes! Comment below. Want to experience what it’s like to live in constant community connection and deep personal and spiritual growth? Join us for New Life, a three month immersion as a citizen in the communities of Damanhur.